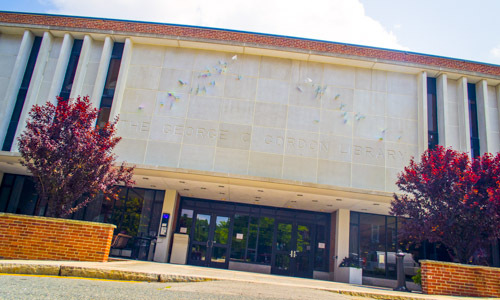 The George C. Gordon Library was completed in 1967, using a major portion of a $5 million bequest from George Gordon, a Cleveland industrialist and member of the WPI Class of 1895. The building was designed to sit on a steep hillside and features four floors of resources and high-tech facilities, including audio-visual work stations, tech suites for group meetings, an art gallery, and a café. The library provides access to a half million print and digital resources, including more than 200,000 bound volumes, 1,200 journals, 150 databases, a digital collection of WPI scholarship, and the university archives. In 2014 a light painting, created by artist Stephen Knapp, that uses treated glass to reflect and refract light, was installed over the building’s front entrance. The artwork was a gift from Phi Gamma Delta fraternity to honor the artist’s father, Walter Knapp, WPI Class of 1938.